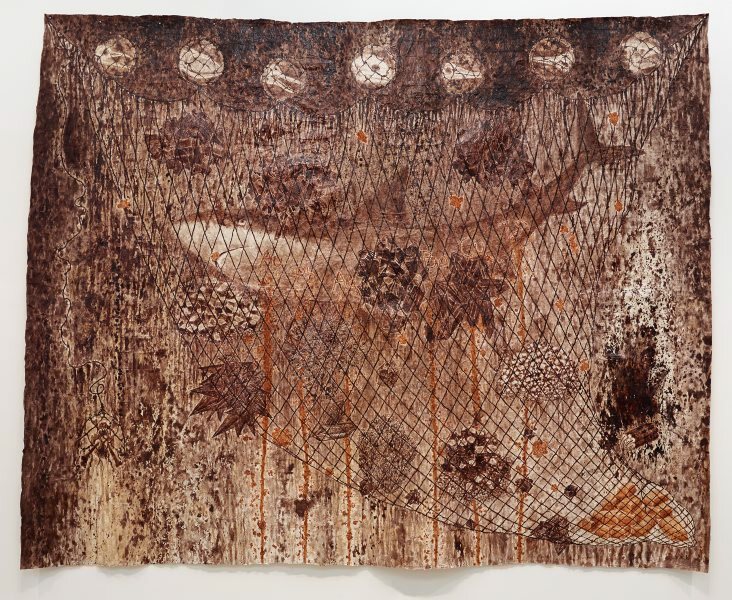 Fiona Hall is regarded as one of Australia's most foremost and important artists. Her issue based practice critically addresses gender, colonialism, consumerism, globalisation, environmental depredation, and the nature/ culture division. 'Fools gold' 2012 was inspired by an artist's expedition to the contested Kermadec Trench led by Pew Environmental Group in 2011. The Kermadec Trench is a 1,200 kilometre channel of overlapping tectonic plates north-east of New Zealand, stretching toward Tonga. The site, a migratory path for important species of marine life and abound with mineral rich underwater vents, is regarded as one of the most geologically dynamic yet vulnerable environments on earth. The Kermadec Trench expedition sought to raise awareness of its preservation as it is a lucrative assist for mining industries and commercial fishing. Hall's 'Fools gold' 2012 directs our attention to this very real susceptibility. 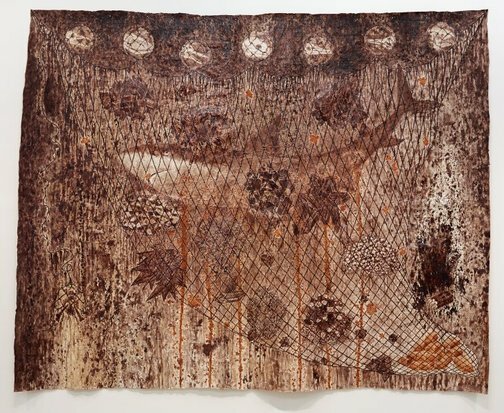 Created in the traditional methods and natural materials of Tonga, Hall has decorated barkcloth made the mulberry tree with natural dyes and ochres. Depicted is a reef shark snared in a net anchored by gold bars and buoyed by floats illustrated with the skulls of endangered species. Scarred into its skin are the periodic elements for gold (Au), lead (Pb), silver (Ag), barium (Ba), copper (Cu) and zinc (Zn). Also entangled are sticks of dynamite, coral, and a skull and cross bones. Kendrah Morgan, David Hansen, Unknown and Unknown, Fiona Hall: big game hunting , 'List of works', pg. 80-81, Bulleen, 2013, 81.